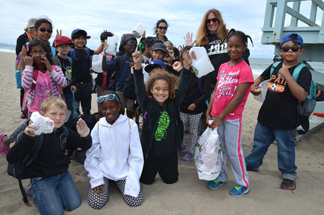 KIDS OCEAN DAY is the culmination of a year-round school assembly program by the Malibu Foundation for Environmental Education to teach school kids about how litter flows from their neighborhoods to the ocean, thereby killing marine life and polluting food resources. To enhance the lesson, nearly 4,000 students from more than 30 Los Angeles-area schools will be taken to the beach for a clean up and to participate in a giant aerial artwork of a Seascape of Ocean O's and Fish, individually designed by each school. KIDS OCEAN DAY will be celebrated on May 19, 2016 at Dockweiler State Beach. KIDS OCEAN DAY is the creation of Malibu Foundation for Environmental Education founder Michael Klubock. Michael started KIDS OCEAN DAY 23 years ago as a way to bring his school assembly program into the real world. The one-day cleanup event motivates the students of Los Angeles to care about their environment and involves them in community service, while instilling good habits and stewardship. Bringing Los Angeles school children to the beach helps put them in touch with nature, while challenging them to recycle, reduce litter and participate in cleaning up their environment. For many of the young people, KIDS OCEAN DAY is their first time at the ocean. The wonder and beauty of the coast, combined with a mission to protect the natural world, is a profound experience. KIDS OCEAN DAY is sponsored by the City of Los Angeles Stormwater Program, a project of the Bureau of Sanitation, the City of Los Angeles Board of Public Works, as well as the California Coastal Commission and Keep LA Beautiful. Those interested in becoming a volunteer at the event, please visit, http://kidsoceanday.org/volunteer.